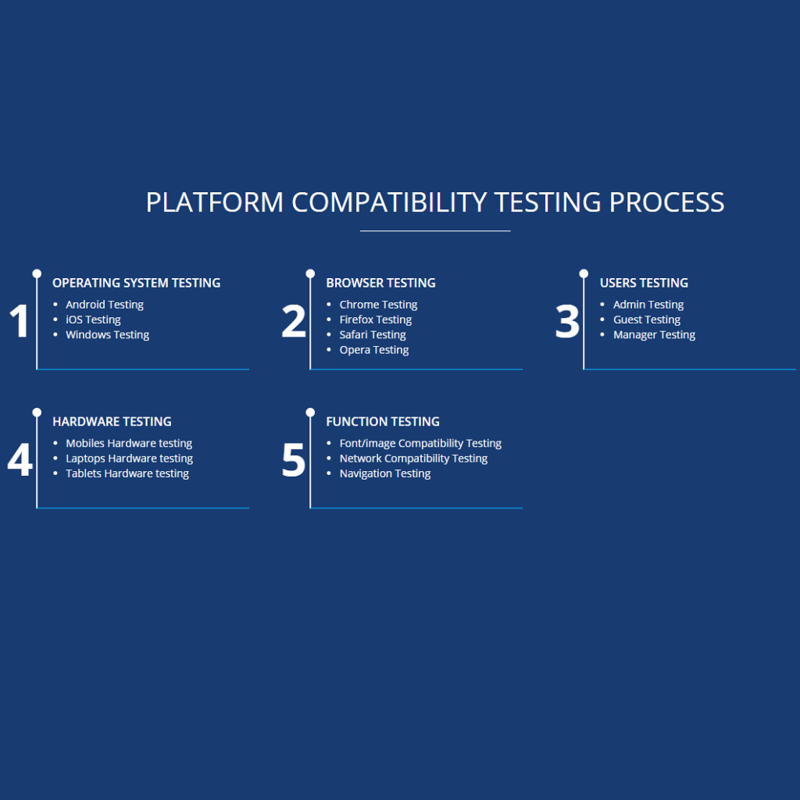 Why Platform Compatibility Testing? Platform Compatibility testing is for every development firm engaged in the process of IT products development, to ensure desired performance on all available platforms. Compatibility testing ensure that an IT product automatically adjusts to all available devices. IT products with accurate compatibility standards will surely beat the existing rivals in market. We have extensive experience in Education, Retail, Government, Media & Financial sector. As a platform compatibility testing services firm we helped many of our Fortune 1000 clients with compatibility test script preparation and analysis. Platform Compatibility Testing checks an app for its adaptability and responsiveness across different browsers, operating systems and devices. It helps in finding out how well a system performs in a particular environment, across variables such as hardware, network, operating system and other complementary software etc. BlackHatWing helps you to perform advanced compatibility testing throughout whole development period. As responsive web design takes over from traditional design development, more and more consumers can now enjoy optimal viewing experiences across a wide range of devices. “Google recommends webmasters follow the industry best practices of using responsive web design, namely serving the Same HTML for all devices and using only CSS media queries to decide the rending on each devices”. Why Responsive Testing? Mobile devices are growing exponentially, more and more consumers are going mobile and businesses needs to revamp entire engagement model to meet this change. Responsive testing of every software and app is essential. Responsive websites always rank on higher positions in Google search results. 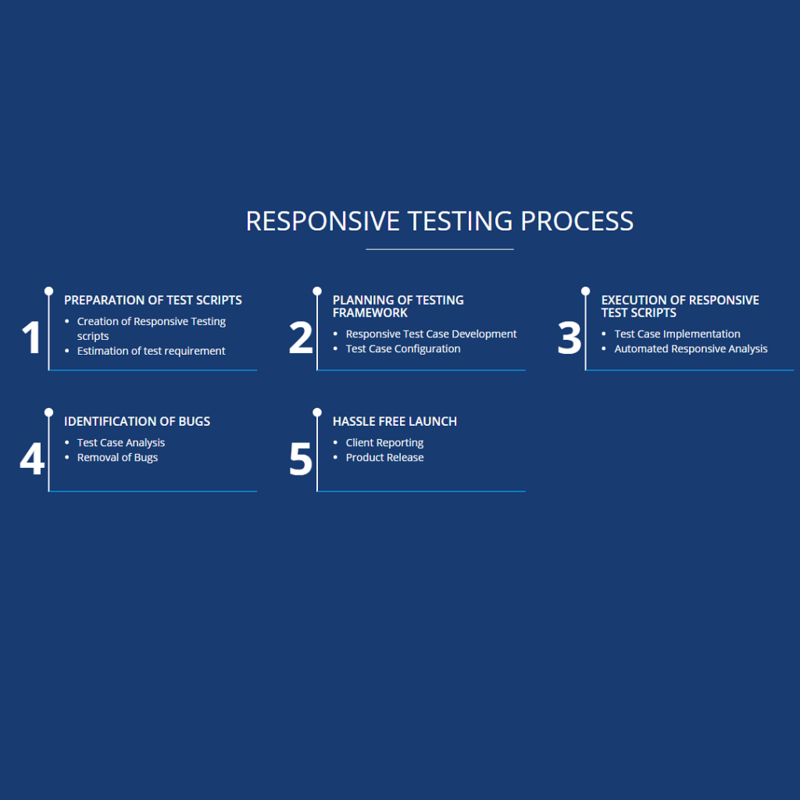 Responsive testing enhances the overall performance quality of any particular website on all mediums. Stay relevant for longer duration on mobile, desktop and phablets devices with responsive testing. Conversion rate of leads into sales will be higher, if your site will be well responsive. Responsive websites design always receive more online user traffic. The more your site will be responsive, the lower will be the user’s bounce rate. Our responsive testing lab is equipped with the top range of iOS, Android and Windows devices including phones, tablets and phablets to ensure maximum coverage within minimal timeframes. We have extensive experience in Education, Retail, Government, Media & Financial sector. As a Responsive testing services firm we helped many of our Fortune 1000 clients with responsive testing framework implementation. BlackHatWing has a rich yet flexible solution to testing responsive design across multiple devices and platforms. Our responsive testing is a winning combo of automation and manual testing. Why Usability Testing? Every app developer should consider usability testing in order to see user reactions and possible areas of improvement before the application is rolled out to users. Usability testing help design & development teams to detect bugs at the earlier stage of development. Usability testing evaluate how much time participants takes to complete a successful task. Usability testing make it sure that users are fully satisfied with your designed Web site or App. 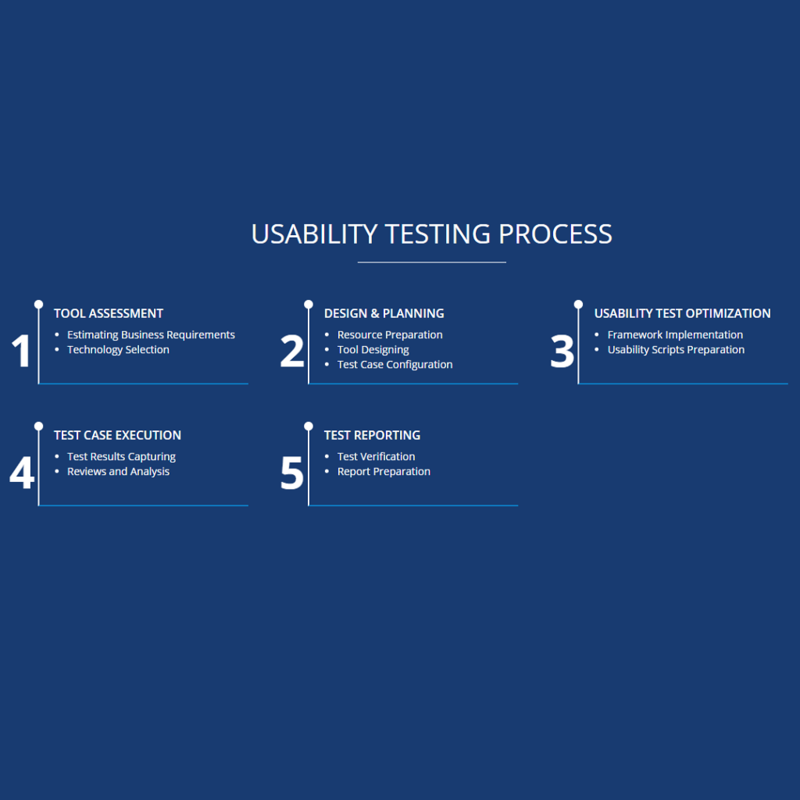 Usability testing measures identify the changes required to improve overall performance. Usability test analysis measures will make an IT product more efficient by meeting required development criteria. 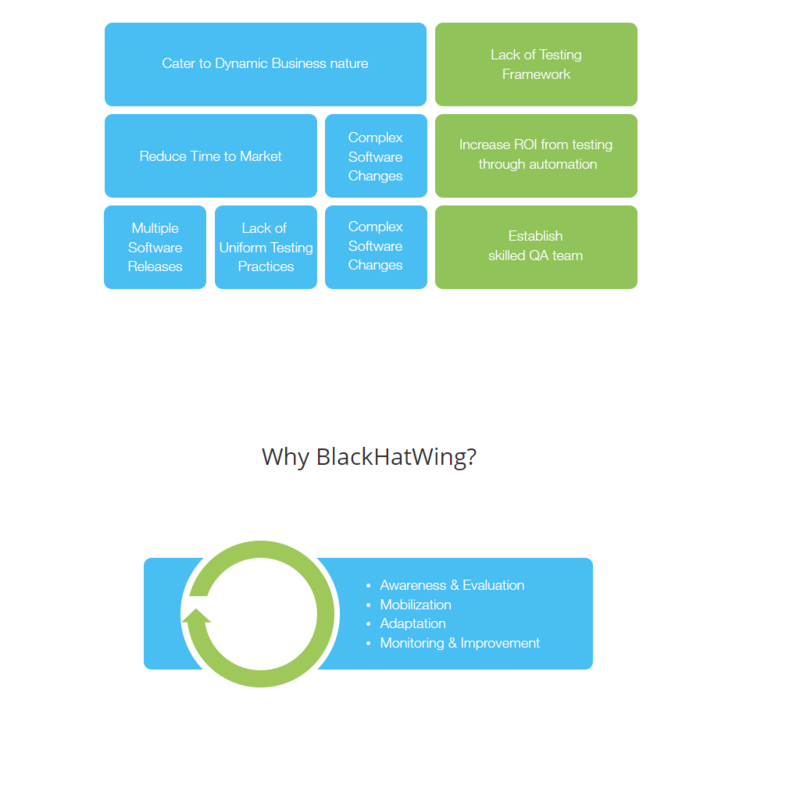 At BlackHatWing, the process starts with a test plan, A/B testing considerations, and participant / tester recruitment as per their profiles, test execution, reporting and assessments. We will help you in successful completion of Usability testing tasks. We have extensive experience in Education, Retail, Government, Media & Financial sector. As a usability testing services firm we helped many of our Fortune 1000 clients with usability testing script development and their implementation. As they say, First impression is the last; a ruined user experience creates a bad repute and simply kills the VIRALITY factor. Your chances of achieving success nose dive even before you start executing your marketing strategy. BlackHatWing will help you to achieve quality of your product. A Testing Center of Excellence delivers proven results by helping companies optimize application quality and performance, improve alignment between business and IT and hence increases QA efficiency. Implementing a successful TCoE requires thoughtful steps, which include gap analysis, organization wide acceptance, process definition, tool selection and other necessary adjustments. In our experience, a TCoE initiative can only succeed if it has strong executive sponsorship and support of the entire organization or an autonomous business unit. Yet, the benefits of having a fully functional TCoE can far outweigh the initial effort and risk, and measurable results can be obtained in a relatively short time. WHY WOULD MY ORGANIZATION REQUIRE A TCOE ?